We had so much success with the Lego firetruck we bought our son, which he opened up last night as is the tradition here for family presents, that he has been up for half an hour and he still hasn’t noticed that Santa left presents under the tree! We’ll wait, eventually he’ll figure it out. Merry Christmas to all 2 or 3 of you reading my blog… I know I don’t write very often, but I won’t make any resolution that I wouldn’t be able to keep. I’ll just keep writing whenever I can. Please keep reading whenever you can, and we’ll be happy forever after. So I am new to this whole thing. How do playdates work? I mean, when our son was really small it was easy: you went to see friends that had kids the same age, but the goal was for you to chat with the parents and the kids’ interaction was secondary. They would play (or scream) side by side anyway. Now that my son is older, I have to call friends to invite them over. I hate that. I hate the phone. And when my son is invited over to the neighbors, I’m not sure if I’m supposed to go with him or let him go by himself. I mean, most of the time I want to go over to the neighbors to get social interaction. But I don’t want to be a bother. What if my neighbor would rather clean up while the kids play and not sit down and have to offer me a cup of tea and be a good host? I get the feeling this is only one of a good many things I’m going to have to figure out over the years! Bibles and various other religious books. Right next to science books. You know that Santa you can write to, in Canada, by addressing your letter to the North Pole with the postal code HOH OHO? I used to write to him when I was a kid. I knew you could write to him in French because after all, Canada Post is a bilingual organization. So I thought it would be cool to do that with my son. He really enjoyed writing the letter, and he enjoyed even more getting an answer a few days ago! I was wondering what we would receive back. Would it be a form letter? If not, would they have found someone here to write a letter in French, or would our letter have traveled to a place where more people speak French in order to be processed? So I was almost as anxious as our son to open the answer. It was a form letter, but with a personalized hand-written note from Mrs. Claus at the bottom. The short sentence made me think that it was done here by someone who spoke decent French, but not someone who lived in a French-speaking place. It was great, though, despite not being perfect from a grammatical point of view. And hopefully when my son is older and starts realizing that people here don’t speak French, he’ll find it even more special that Santa speaks French. As long as he doesn’t start speaking French to the Santa at the mall. Mmm… There is a potential problem. Maybe I should reconsider that! Our camera had better be fixed! About 6 months ago, we bought a new camera, an Olympus Pen EP-2. After a few months, we noticed that every once in a while, vertical lines appeared in one of our photos. But it was so few and far between that we didn’t worry too much. Except that eventually it got worse. The wrecked photos came closer together. Zak re-mounted the lens and it didn’t happen again for a while. Then it came back. Sometimes it was in light conditions, sometimes in low light. We couldn’t link it to anything specific. In August, it got really bad. Every time we used the camera, we would get some wrecked photos. We had to turn off the camera and turn it back on to make it go away. The camera was still under warranty, so Zak inquired about getting it fixed. He was told to ship it for repair, but we were expecting our baby so we didn’t want to be without a camera. We asked Zak’s parents to bring back our old camera, which we had lent them. The baby was born, but the camera wasn’t acting up that much anymore, so the months passed. Finally, at the end of November, we figured we really should get it fixed. We shipped the camera. Two weeks later, it came back. The repair slip said “Tested without failure”. Zak took about 20 photos and the lines were back. The service guys didn’t actually do anything! I guess they took a few photos, nothing happened, so they shipped it back. We were really pissed, especially since Zak took the trouble to send a DVD with tons of example wrecked photos and videos. Zak called and spent about half an hour on the phone with the technician, who was amazed when he saw the photos. He said to ship the camera back. We were disappointed because at that point we were hoping they would send us a new one. But we had to ship it back. They said they would pay for shipping, but the fine line said they would pay up to $20. Of course, we wanted the camera back as soon as possible (what with Christmas fast approaching and all) so we paid for express shipping. Between the two shipments, we paid $100. Their $20 won’t go very far. We were not very happy customers. Now the camera was, in theory, shipped back to us today. This time, they replaced something, so hopefully it will work. But our son has his Christmas show with preschool tomorrow. So if we want a camera that takes video, we’ll have to rent one. That’s another fee to add to our repair bill. So I can’t say we’re super happy with our Olympus experience so far. Our old camera was a Canon and we had it 5 years without any problem. This one didn’t make it to 6 months and the service was far from perfect. Let’s just hope that the camera is here tomorrow and in good shape! My son has taken to pointing with the wrong finger. You know, the one in the middle. He doesn’t know that he shouldn’t – well, he does now because we told him. But he doesn’t want to give people the finger. It’s just that naturally, when he wants to point, that’s the finger that comes up. Every single time. We are trying to curb that bad habit, but it’s hard! Today I mourn the loss of a man I have met only a handful of times, but I am still deeply touched by his passing. His name was Bob. He was Zak’s great-uncle – he married Zak’s grandmother’s sister. In the ten years since I met Zak, we visited his family a few times, and their warmth struck me. They always treated me as part of their family. Zak had not visited them much through his teenage years, and he reconnected with them more recently. We became closer to Bob’s granddaughter, especially after she got pregnant and had a son. When our boy was born, though, Bob didn’t have great-grandchildren yet and he took a liking to our son. Right away, he started speaking French with him. I didn’t even know he spoke French, and I don’t think he had spoken it in a long while – he was pretty rusty. But I found out he grew up speaking French in Saskatchewan, and the fact that he cared enough to speak French to our boy, even though he seemed to be too shy to speak it with me, touched me deeply. A year and a half ago, Bob lost his wife of 66 years. As you can imagine, it was a very hard time for him, and in the eighteen months that have gone by since, we saw an old, but healthy man who could still play soccer with our boy become a frail, elderly man using a walker and getting more confused with every visit. Last week he had a stroke and this weekend he went away. Apparently, he was getting tired of being old and sick and lonely. Bob led a good life. 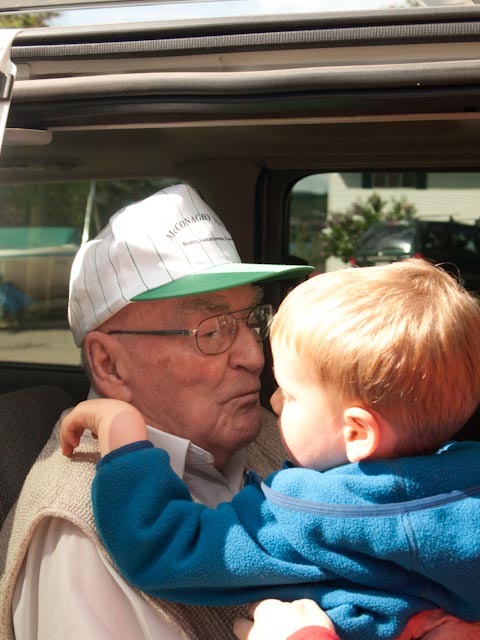 He died at 93 and he had time to meet his great-grandson, who will be one next week. This little boy had become his pride and joy. Unfortunately he won’t remember his great-grandpa, but he’ll have photos and stories of how much Bob loved him. I’m glad my son had the privilege to meet him. My grandparents are long gone, but today I wish Bob had been my grandfather. I didn’t know him much, but enough to see how caring and loving he was. He was a great man. He will be sorely missed.